Explore individual asanas separately and in depth. The Beginner Pose Library course will help you to consolidate your understanding of core Iyengar poses at the beginner level. These tutorials encompass a range of key Iyengar yoga poses at the beginner level. Gaining a more detailed understanding of these asanas will help to prepare you for the intermediate level classes. Outline: Downward facing dog pose is a well known yoga pose that can be practiced in nearly every yoga sequence. It is energising and strengthening when practiced actively, calming and rejuvenating when practised with support. The pose is presented initially in a modified form, which is helpful if you have stiff shoulders and hamstrings. You will then learn techniques that will bring you more deeply into the full pose. Benefits: Increased shoulder, spine, hamstring and calf flexibility. An overall strengthening pose. Outline: This tutorial introduces the seated poses Baddha Konasana and Janu Sirsasana. Experience the benefit of linking these two poses together. Learn the hip and knee opening first, then develop the straight leg position. The option of using of props to support your spine and protect your knees is explored. Benefits: Improved hip, groin, knee and hamstring flexibility. Helps build lower back flexibility and strength. Outline: This tutorial introduces the twisting pose Bharadvajasana. This is a great pose for exploring the basic principles of all the twisting yoga poses. You will learn how to set yourself up with a stable foundation and then apply techniques which help to create space in the spine as you turn. The alignment of the body in this pose is more complicated than its companion simple cross leg twist. This tutorial systematically breaks down where your feet need to be, what angle your hips need to be, and the role of the arms in steering the pose. The twisting poses can be inwardly penetrating in their effect and are traditionally considered to be helpful for the abdominal organs. Benefits: Improved spine, knee, shoulder and neck flexibility. Helpful for abdominal organs and digestion. Outline: Chatushpadasana introduces fundamental techniques that are used in other more complex back bending poses. You will learn the correct position for aligning the shoulder blades. This will help you later when learning Salamba Sarvangasana (shoulderstand). Chatushpadasana can help to give you a sense of what an "open chest" feels like. Benefits : Increased upper back flexibility, increased shoulder mobility, chest opening, increased leg muscle strength. Outline: Join Rod in this exploration of the shoulder opening poses Gomukhasana and Garadasana. Learn techniques for modifying the poses if you have restricted range of movement. Gaining flexibility in the shoulders and upper back will assist the development of most poses at this level. Benefits: Increased shoulder mobility, increased upper back flexibility, neck release. Outline: Regular practice of the fundamental standing pose Parsvakonasana will assist you in strengthening your leg muscles. It is an asana that also helps you to build greater hip and shoulder mobility. Learn the basic points of alignment and develop your understanding step-by-step. Benefits: Increased spine and leg muscle flexibility and strength, increased shoulder, hip and ankle mobility. Enhanced overall body strength and awareness. Outline: This video tutorial introduces the fundamental standing pose Parsvottanasana. You will learn how to lengthen the muscles at the backs of the legs without putting strain on your spine. Techniques for performing the pose without collapsing your chest are explored. Learn the hip rotation and foot placement fundamental to this asana. Benefits: Improved hamstring flexibility, increased ankle and spine mobility, enhanced overall body awareness. Outline: This tutorial introduces the standing pose Prasarita Padottanasana. It is an ideal asana to be practicing when first starting yoga. It highlights and corrects stiffness in your leg muscles and hips. You will be guided through the pose in stages, learning techniques to correctly align the spine as you progressively get deeper into the pose. Benefits: Increased leg muscle flexibility and strength, increased hip mobility. With continued practice this pose will have a calming effect. Outline: Learn how to set up for Supta Buddha Konasana. This pose opens the chest and hips whilst promoting relaxation. 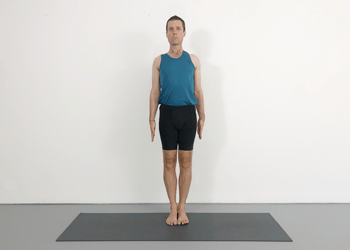 It is an ideal pose to use at the start of each practice. Learn how to correctly position props in order to maximise the benefits of this rejuvenating pose. Benefits: Opens the chest, gives freedom to the diaphragm, softens the abdomen, improves flexibility in the hips and knees, promotes relaxation. Focus: Supta Virasana is a great pose for improving knee mobility, and quadriceps flexibility. It is eventually an ideal starting position for an active Iyengar yoga sequence. This tutorial guides you through three different approaches to the pose. Initially a version of the pose is included for newer students working with stiffness. You are then shown how to gradually reduce your reliance on supports. Eventually you practice a version of supta virasana that requires only a bolster and blanket. Once this pose has been consolidated, it can be used as a starting point for your practice sessions. Outline: Tadasana is an ideal starting point if you are new to yoga. It is also a pose experienced practioners can use regularly to assist with a process of ongoing refinement of body awareness. It helps you to learn how to align your whole body in order to balance evenly over the soles of the feet. Your spine will become more supported and stronger as you work with the actions that strengthen your legs. This solid foundation will help you to stand with a more open chest. Tadasana is a pose which simultaneously contains some of the most basic and advanced yoga teachings. Benefits: Helps to improve overall body awareness and posture. Highlights and corrects poor posture habits. Promotes a sense of both physical and mental stability. Outline: This video tutorial introduces the fundamental standing pose Virabhadrasana I. You will learn how to correctly position your legs and hips. Once your legs are more grounded you will then start to build in the arm actions. Techniques for avoiding twisting and compression in the lower back are explored. Benefits: Improved balance, increased leg muscle strength, hip flexor lengthening, increased hip and shoulder mobility, increased overall strength and energy. Do you have a PDF beginners’ sequence for handy reference?